Periodontal (gum) disease is a serious matter. Not only can it wreak havoc with your gums, it could also cause bone loss in the jaw that supports your teeth. Gum disease is a bacterial infection that originates from a thin film of food particles on tooth surfaces called plaque. If you're not diligent about removing plaque through daily brushing and flossing, it can become a feeding ground for certain strains of bacteria that trigger gum infections. Left untreated, the disease can advance deeply into the teeth's supporting structures. Treating furcation involvements can prove challenging because the infection is usually well below the gum line (sub-gingival). As with all gum disease treatment, our primary approach is to remove all plaque and calculus (hardened plaque deposits) where we find it, including around the roots. We typically use specially shaped instruments to clean the root surfaces. We can also employ an ultrasonic device that loosens plaque and calculus with high-frequency vibrations and flushed away with water. 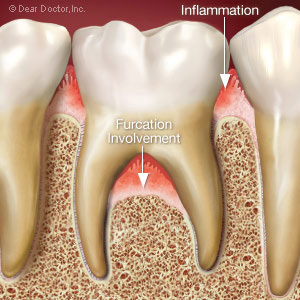 Sometimes, we may need to surgically access involved furcations to clean them and stimulate bone growth with grafting. We can also use surgery to make the areas easier to clean — both for you and for us during your regular office cleanings — to prevent reoccurrences of infection. Of course, preventing gum disease in the first place is your best defense against oral problems like furcation bone loss. Be sure you brush and floss every day, and visit us for thorough cleanings at least twice a year (unless we recommend more). This will help make sure not only your gums, but the bone that supports your teeth stays healthy.